All American Fun Park has activities galore. Two miniature golf courses, over fifty arcade games, sixteen bowling lanes and much more! Get wet at The All American Fun Park! Try the blaster boats, but watch out for that squirting alligator and the waterfall! There is a height requirement to ride. You must be 44" tall to ride this ride; however, an adult (16 years or over) may ride with a Bumper Boat passenger that is at least 36". Sorry, no pregnant women may ride this ride. 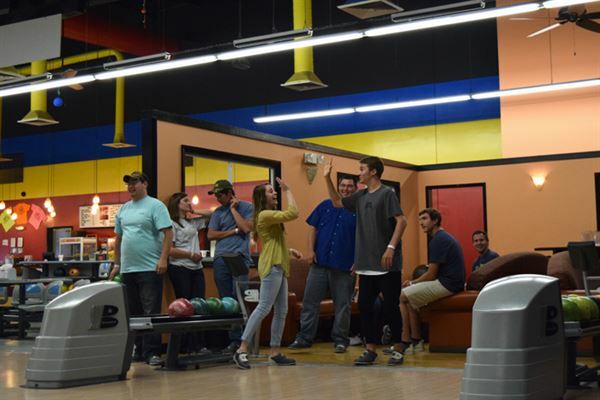 Fun for the whole family, the bowling center is appropriate for athletes of any size and age. Our SPIN ZONE bumper cars feature an inner tube design, making them safe and incredibly fun. You must be 42" or taller to drive yourself, passengers must be at least 36".Grab a hold of the handles to move forwards or backwards; but watch out, your opponents will be aiming for two Spin Zone targets on your car. If they bump either one of your targets and activate the Spin Zone, they will send your car into an uncontrollable 3-second spin! But have no fear, by bumping your opponents targets, you, too, can send them into a tizzy! Zoom! Zoom! Zoom! The All American Fun Park has the fastest carts in the area! With a 1/4 mile, "Figure-8" track, this activity is a must for those fast-paced peoples. There are some Rules though: You must be 56" tall to ride alone. You must be 42" tall to be a passenger. You must be 18 years old and have a valid ID to drive someone in a go-kart. You must have fully-enclosed shoes. No Bumping. If you are pregnant, or if you have heart, neck, or back problems YOU SHOULD NOT RIDE THIS RIDE. The Go-Kart track is closed Monday-Friday until 5pm during the Dougherty County school year. Welcome to Pirates Cove Laser Tag! The All American Fun Park has a massive black light arena, where the adventure begins in an exciting game of laser tag. The game is set up with two teams, a red team and a green team. Each team has a base that the other team is trying to score on, and each team member wears a vest with laser sensors on it. While tagging the base is the best way to score, team members may also tag the opposing team for points. This activity is recommended for ages 7 and older. Another reason for the age recommendation is that our vests are all "one size fits all", so they may not be comfortable for small children. There is a five-minute briefing to explain the game, and the game itself is ten minutes. Whether you're trying to perfect your secret spy skills or show off your agility and flexibility, Lazer Frenzy is the ultimate challenge! With 4 separate game modes and a high scores leader board, Lazer Frenzy is sure to keep you entertained! The VR2002 Maxflight Roller Coaster is a futuristic voyage through an awesome space asteroid. Riders soar, spiral, plunge, twist and shout pulling genuine G-forces. Premium-quality surround-sound and the feel of real wind in your face creates a true adrenaline rush. You will flip over the Maxflight virtual roller coaster! This incredible machine will guarantee you a safe, yet unforgettable ride. It flips and rotates for a wild virtual coaster experience. You must be 48" tall to ride. Two people must ride at one time. If you are pregnant, or if you have heart, neck, or back problems YOU SHOULD NOT RIDE THIS RIDE. You should not ride if you have had recent surgery or illness. The All American Fun Park has two 18-hole miniature-golf courses. Enjoy lovely scenery at all times of the year, and learn about our animals and American symbols. Our courses are designed for both children and adults, so bring your whole family out! We have a full service snack bar and offer pizza, hot dogs, nachos, ice cream, popcorn, candy, cotton candy, energy drinks, drinks, and more.